Pickle & Bree’s Guide to Good Deeds – The Decorating Disaster has been shortlisted for the 2016 Speech Pathology Book of the Year Awards in the 5-8 age group category. I am absolutely thrilled! Congratulations to everybody who has been shortlisted. The next two books in the Pickle & Bree’s Guide to Good Deeds series are to be released in February 2017 by The Five Mile Press. The Speech Pathology Australia Book of the Year Awards aim to promote children’s books as literacy tools, as well as raising awareness of the role of speech pathologists play in helping children develop language and literacy skills. The awards promote quality Australian children’s literature;enhance awareness of the role speech pathologists play in language and literacy development; and encourage a love of reading. Congratulations, Alison. I had missed this news! 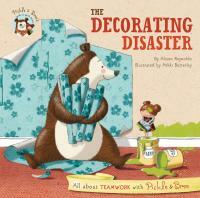 Congratulations on your fabulous and deserved shortlisting for Pickle and Bree’s “The Decorating Disaster”, Alison. Best of luck in the final Speech Pathology 2016 Book of the Year Award.